Air walkers, bench presses or even twisters, the park beside Ulsoor has an open air gym, and we’re loving our morning workouts here. 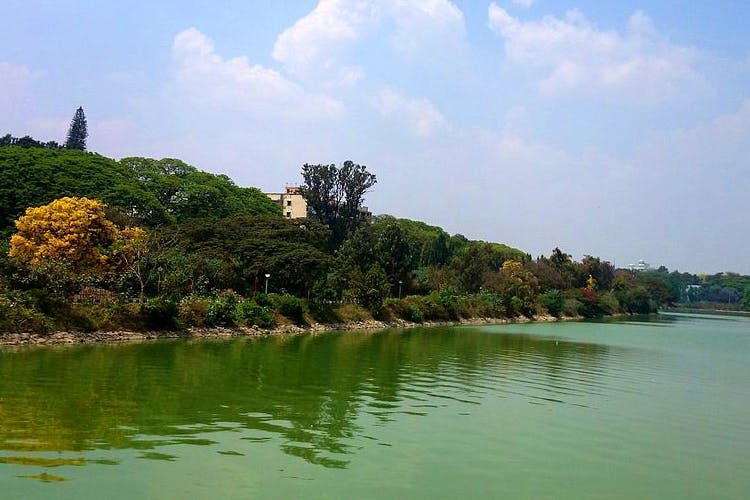 Sure we’ve all whined about the err… aroma… of Ulsoor Lake, but now that that isn’t much of a problem, working out is a joy here. While the running track that circuits the lake is still there (and the extension of it will be ready soon, we hope), the revamped open air gym is what caught our eye. Sceptical at first, we tip-toed towards this park one morning post a run and lo and behold, it’s been spruced up and how. With air walkers, sit-up benches, steppers, and even sit-up stations, this park gym will take care of your cardio, even if you don’t have time for a walk/run along the lake before! For those just looking to add on to cardio, the leg presses, exercise bars for pull ups, knee raises or reverse shrugs, and even the twisters are great to tone your body. Don’t expect super high-tech stuff, this is basic, functional and thankfully waterproof. So, come rain or shine, you can’t skip a workout now! What I really liked about the atmosphere was that people are non-judgemental. There’s also an unwritten rule wherein you can’t hog the equipment for too long. People seems to automatically slip into a circuit training routine, so when I went, I too got into that. Since most walkers and joggers leave the space by about 8am, when the sun starts to beat down on you, it’s quite empty. So if you don’t mind the heat too much, go a bit later for more privacy. Although the street is right across, so let’s call it relative privacy!